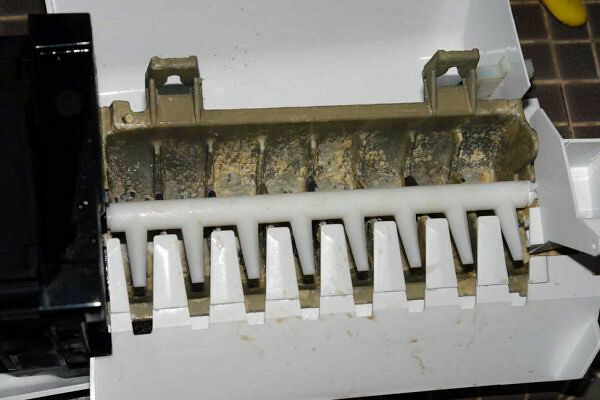 Noticing some weird crud in the ice from your icemaker lately? You may have a defective mold, like the one shown here. A healthy ice maker should NOT look like this. This rough appearance is caused by the teflon coating on the ice maker mold flaking off, depositing Teflon flakes into your ice. Very hazardous to your long-term health! If yours looks like this, then you may be interested to know that ingesting Teflon causes systemic arthritis in all the joints. Think twice about using an icemaker with this affliction because eventually you’ll find your own body afflicted as well! The only cure is to replace the icemaker. Come git you one! This entry was posted in Ice Maker Repair, Refrigerator Repair on August 7, 2008 by Samurai Appliance Repair Man.